Ideal for stock work, camp-drafting, sporting, starting young horses and trail or endurance riding. 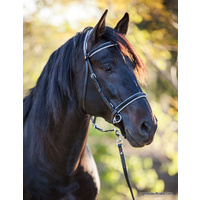 English leather Stockhorse bridles reduced to $99 (from $139) until sold out. The LightRider Stockhorse bitless bridle features a new cheekpiece buckle to allow for better replacement options or a bit to be used as well if you need one for competitions, or your transition to bitless. Old style stitched cheek to noseband is still available in cob size in dark brown beta biothane. Padded noseband, headpiece and brow band offers more comfort for your horse. Self adjusting poll/browband placement as they rotate around the headpiece ring. The noseband sits higher like a cavesson so doesn’t need to be tight, allowing the horses to eat and drink easily. 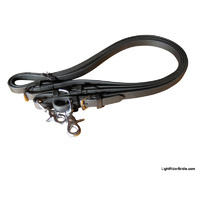 Multi purpose for leading too, or the lead ring & connector strap can be removed for ridden show classes. Also a great option for showing in lead line classes. Unique Chinstrap: The soft webbing chin strap keeps the noseband from twisting to give clear and direct communication. This means you can use lighter rein aids. When rein pressure is applied the chinstrap becomes snug but does not over-tighten due to the type of webbing used. 90% of the pressure is on top of the nose, and the horse can self release the chinstrap easily for eating, yawning etc. 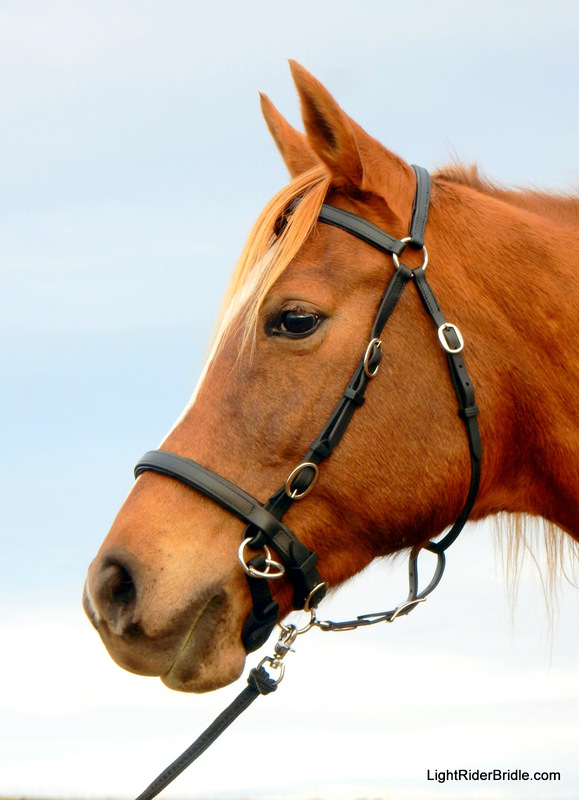 The bridle can also be used as a sidepull by clipping the chinstrap and noseband rings together (recommended to start with if your horse hasn't experienced a chinstrap before). Learn more about the use of the chinstrap here. Check the sizing guide to see how to measure your horse. This bridle does not include reins because it allows you to choose from the selection of LightRider Reins available here or you may already have reins you can use. I recommend you use scissor rein clips for easy change over to the leading ring which enables groundwork/leading/lunging, or buy LightRider Reins that include rein clips to match. Take advantage of the FREE email photo consultation to check the bridle fit and sizing for your horse within the 30 day return period (from date of receiving). When emailing photos, please reduce the size if you can. Comes in black, brown or tan in drum dyed leather or black and brown in Beta Biothane with stainless steel hardware. Made from synthetic (leather-look) Beta Biothane and quality drum-dyed (regular) or english leather. Extra padding on the headpiece, browband and noseband. Maximum comfort around the poll/brow as they can rotate around the ring. Risk Free Guarantee. You can return your Light Rider Bridle (in clean as new condition - please wipe over with a damp cloth) within 30 days of receipt if you or your horse are not happy with it. See our Returns Policy for instructions. LightRider Bridles have a 12 month warranty against manufacturing faults. This is the 3rd lightrider bridle I’ve purchased. All my horses go beautifully in these bridles. I’ve tried a number of other bitless bridles over the years but none can compete with the light rider. Love this bitless stock bridle so much I am thinking of getting another just for competitions. So soft and my horse is much softer in it. He is clearly comfortable in it. My anxious pony is so much happier in her LightRider bridle - less headshaking and no mashing the bit. Extreemly happy with the quality and fit of the bridle also. This item is the most pliable comfortable fit for my horse .. 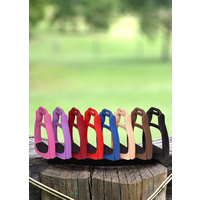 Durable easy care & looks great too ..
Leather Bitless halter Perfect for my needs. Stays in place. I removed chin strap, not needed. Good fit. Soft backing on straps, soft contact on my horses head & face. Adjustable to size. I do many activities using this bitless bridle, at varying gaits. With legs aids, just a gentle contact on the bridle is all that my horse needs to complete our tasks. When I first got her and she had a bit, she would always move her head away in a statement of avoidance ... never with Cynthia's bitless bridles. I am not skilled enough to use a bit "comfortably for my horse" so bitless makes me very happy, and it is evident with my horse that it is her preference; and there has never been any occasion when I have not been able to control my horse - and she'll stop on a dime from a canter with just a little pressure and my posture. I like the leather as it is very smart. My Natural Rope bitless is beaut also - they work just the same! Love the stockhorse bridle and especially the new chin strap cover! This is the 3rd bitless bridle I've purchased from natural horse world, and won't go anywhere else! I wrote a review saying I wish the chin strap would release easier but my mistake. I took all my reins home and weighed them on my kitchen scale. The reins I was using were to heavy. 300 gm or less definitely gives you the proper release. Thank you so much for making such a great bridle! Value is great! I plan on ordering another one. I really like this bridle and my horse seems to like it as well. when I received it in the mail the chin strap was on backwards, other then that it seems a good value for the money although next time I'll splurge and order this bridle in the beta biothain. it has great padding where horses need it I just wish the chin strap would release easier ( I understand it's when they yawn or eat ) BUT it doesn't seem to bother her and I can always clip the reins onto both the chin strap rings and nose band rings. My horse took to this bridle right away and does great in it. looks great to! Thank you so much for making this bridle! everyone should ride without a piece of metal in their horses mouth. The bridle and reins are just great, they are very good quality, and really amazing for the price. The reins are great and I love the clip idea. As soon as I dismount I clip straight into halter mode, the horse can feel the difference, its great for communication. Because they are on swivel clips the reins never twist so I never need to fiddle with them, helping both me and the horse to focus on real signals instead. In a bit his jaw was tense and so was his head and neck. He now has a lovely soft head and neck and amazingly his whole body is now soft. In a bit he must have had a tense body as well but I was so focussed on trying to keep control I never noticed just how tense he must have been. Bitless is a whole new style of riding, soft and focussed and so much more responsive. 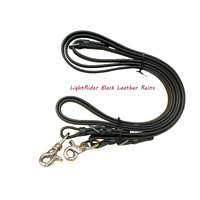 The LightRider Stockhorse style is perfect - quality leather, soft, doesn't twist, gentle yet more effective than any bit and kind to the horse and rider - I no longer have to work up a sweat arguing with my horse, my whole body stays soft as well and I am no longer puffed after a ride! Rose V.
I was 15 when I broke in my own Arabian gelding with this bitless bridle (using natural horsemanship methods). He has the best brakes, stops and turns with the slightest touch of the reins. He absolutely loves it and comes to me in the paddock and puts his head down for me to put it on! I also have a mare who I used to ride in the bit, and she had terrible issues with bolting over jumps. I put the stockhorse Lightrider on her that i use for my gelding (very easy to adjust), and amazingly, she has responded very well to the chinstrap and no longer has issues with resisting to slow down, she is also going over jumps without leaping and taking off! I highly recommend this bridle to anyone who wants to ride their horse bitless! Highly recommend this bridle and any of Lightrider's products. Thank you for making this, best thing ever! I love this bitless bridle. I have plenty of room in it to fit both of my horses one who has a larger head and one who has smaller head. Plenty of room for adjustment. I bought this bridle for my almost 3 year old spotted draft . I have been using it to teach her to drive on long lines. I like the stockhorse version because I plan on introducing the bit with it, since it has the extra buckle on the cheek straps. 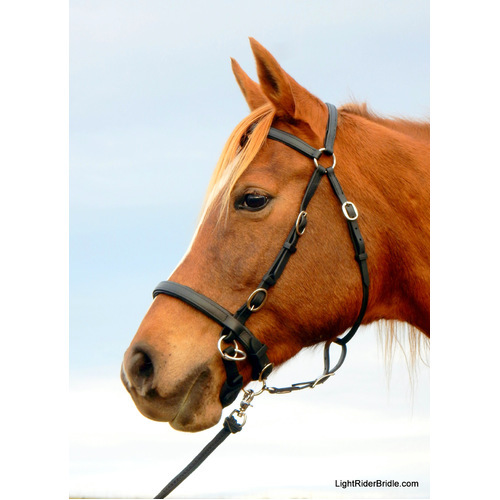 I purchased the Lightrider Stockhorse Bitless Bridle and found it to be an excellent buy. The quality of the leather, the fit and the look of the bridle are all excellent. My horse is so much more responsive and happy as a result of not having a bit in his mouth. Good work Lightrider! 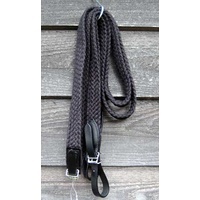 I have been using the Lightrider rope bridles on my two horses for many years. We do trail riding, stock work, endurance, everything! I decided to upgrade to the leather bridles and think my horses look great in them. One of my horses is halfway between a cob and full so I had to punch extra holes in the leather but that was no problem. The bridles look good and fit well and my horses look relaxed and happy in them. Bridle is a good quality for price (although basic leather a little hard until treated). Love this on both trail horses! We have two trail horses who were used as kids camp and adult rentals out in Estes. Both had been jerked around for years. To them, having a bitless bridle is heavenly. And they're such good boys, they deserve to be pampered at this stage in their lives. So glad these bridles are available for our sweethearts. I have the Beta Stockhorse headstall. My mares are both 1000+ mi endurance horses & quite forward movers. I have been racing them in an S-hackamore that works very well on the trail. For arena schooling I have tried various bitless options but none of them gave me the sense of connection that I have with a snaffle bit. I am so pleased with my new LightRider bitless bridle. Both mares respond very nicely in it and I am able to ride with a soft contact and good feel. I've only had a chance to school in the arena a few times since I got the LightRider but I've seen definite good changes in how my mares are moving and accepting my aids. I am eager to try the LightRider out on the trail and see how they respond in the more exciting atmosphere. First couple of days, Jax decided to take detours to explore woods more, but I really noticed how after a couple of weeks he listened more to my leg and the lay of the reins. We both love it now. It's soft after Neets Oil, very well designed, and perfectly adjustable. I feel good about him having it. We didn't meet till he'd put in most of his life at a trail riding outfitters, so he'd put up with a lot. Being in touch with him respectfully and lovingly is a pleasure. He's a big love, and deserves the best. Thanks to whoever made this bridle! Beautifully made, fits great,superb quality. We're loving it, we ordered the leather stock horse bridle which arrived within a couple of days. Also ordered the DVD as this is our first bitless. I found the DVD very informative and enjoyable and well worth the money - a must see if new to bitless. Ordered the split reins too in brown & gold to complete our overall great look. Thank you for such great products and service. My pony has a dropped palette so can't have a bit in his mouth. He is really happy in this bridle. All the things you can do with a normal bridle you can do in a LightRider bridle. The quality of the leather is excellent. I wouldn't swap this bridle for anything else. The sizing is perfect for my pony. I'm in the UK and the bridle arrived within five days. Also thought the price was good too. This is my second Lightrider bitless bridle and I love it as much as the first. The leather in this bridle is of good quality and is beautifully made. My mare Ginger looks fantastic and responds wonderfully well. She is so relaxed and responsive and I can honestly say that I would never go back to the bit. I'm going to start her foal with a Lightrider as well when it's his turn. I have converted my friend Chris and her three horses as well, all are doing so well, we are BIG fans. Thankyou Natural Horse World. I have been riding bitless for many years now and have always purchased side pulls from the US, initially as it was impossible to get them here and subsequently because I didn't get on with the cross under bitless bridles. I decided to try the stock bitless bridle and love it. 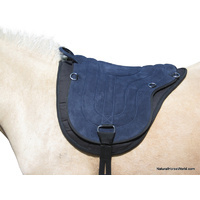 The quality is excellent, it fits beautifully and I love the fact that you can lead and it doesn't slip.....Excellent product I will definitely buy more for my other horses. This is a teriffic bridle as you know. The only fault I can critersize is the chin strap buckle, that gets caught on the rings so as to pull from the near side not the far side as it should. I think maybe a fixed size chin strap that is stitched instead of a buckle might be more appropriate. Store Owner: We started with a fixed chinstrap but that didn't allow any adjustment. It sounds like your chinstrap is way too long if the buckle is getting caught (or the buckle is not centred). Love this equipment...my horses love it too! This is my 2nd bitless bridle. I am a fan of this equipment and so are all of my horses. I have 3 quarter horses and 1 gaited horse, they all respond great to the bitless bridle. Very happy with this bridle so is my boy. He is usually very spooked after riding with my rope halter underneath my bridle with bit. I realised the boy pulled up a lot better with halter reins, inspired by Carlos Tabernaberri dvd - found this website, chose this bridle and so glad I did. Also took advantage of the dvd discount which has helped so much - highly recommend.. I love the LR Stockhorse Biothane! It looks very neat and stylish on any breed (especially arabs) and isn't too bulky. Also, the biothane is super easy to clean. I rode with the halter and lead rope for a while and wanted something with more. I tried another bitless bridle and didn't like the results...it didn't seem to give the release that is necessary. So I researched some more and found this website--read the articles and reviews and decided to order. Needless to say I loved it, my horse loves it and it gives the connection and release needed! And it looks great! Thank you, Cynthia - I keep recommending it to my friends. My little Arab is totally loving his new bitless bridle. He responded almost straight away when I first used it on him. So light and easy in the hands. Easy to put on and take off and looks awesome on him. Very happy with my purchase. Also bought the rope Light rider reins and they are beautiful and soft in your hands. Love that you can use this bridle to lead with as well. Very happy with my purchase. The light rider bitless bridle has given me the opportunity to have a real conversation while riding my horse, due to the absence of pain, which otherwise is caused by a bit. When a bitted bridle is put on my horse he becomes stressed and tense. Even before I place the bit in his mouth his whole body tenses and his head goes up. Now using the LightRider bitless bridle he lowers his head and waits for me to slip it on. He is also not afraid of being accidentally jabbed in the mouth and with his new barefoot treeless saddle the combination is beautiful. He is more willing to tune into me and concentrate on what I am asking. The LightRider bitless bridle also looks like a normal bridle which I love. Thanks Cynthia for a wonderful product. The Stockhorse bridle is fabulous thanks. I have ridden my horse 'Huckleberry' in a crossunder style bridle as well as a riding halter bridle, and yours would appear so far to be the most comfortable one from the horse's perspective. My horse usually has impeccable manners when on his own, however when with a group of 'mates' he gets understandably excited, and sometimes I have to apply more pressure than I would normally like, in order to get him to listen. So far so good. Yours looks lovely and fits him well. Thanks again. "Just to let you know that I have fitted the Stockhorse Bitless Bridle and it looks great!!! It looks and even smells like leather! I had a look at one of your bridles at a clinic back in January. Since then, I've been doing some research and liked yours the best. I put the bridle on Wunjo at liberty.....at first I think he was expecting a bit from the way I put it over his ears (we've only been using a halter for the last 2 years), but once on he relaxed and we did a very small bit of ground work with excellent results. We'll be taking however long it takes before I'm in the saddle with it, but once there, I'll have more feedback for you. I'm looking forward to experiencing a ride with the new bridle. Thanks so much for taking the time to figure something out to help our horses have a better life with humans and for making it available to anyone who wants to try it out!!! "